Cover art is very important, as often even before a synopsis is read a prospective reader will see the cover. If you are in a list the title and the cover is all they have, and it must catch the eye and interests of a prospective reader. It helps if it fit’s the book tonally too, so it is not jarring to a reader if they see an epic fantasy like cover then read a story mainly focused on economics. The cover you see is not the first draft, and it is significantly different than the first. The first had an authentic Minoan background, but it clashed a lot with the rest of the cover, and some people thought it would repel readers. We chose the current background you see of a Labyrinth due too it’s importance to the story, and that it gave a neutral tone so the rest of the cover would “pop” better. Also, the stark lack of details about book plot from the cover was done like many thrillers. The intent was to give more of a feel and less of a preview of what actually occurs in the book. The only tone aspect that is not shown in the artwork is the “flippant” (think more Terry Pratchett) tone some chapters are told in due to who the characters are. Each chapter is written featuring specific characters, and when that is happening the “voice” of the chapter synchs with who is starring in it. So a chapter about a priestess or a bureaucrat will be more serious than one told from a rather frivolous artist or gruff outsider. With all of those differences there was not a way to convey this on the cover without clashing in a very “busy” manner. I do like the details in this cover and it holds up very well when increased in size, and I may eventually make this book available for print (there was resolution issues with my last one, and I will not be able to have that book ready for print until I can resolve them). As for other final touches, the book will come out this week, most likely Wednesday or Thursday. There will be a blog post when it comes up. I’m just doing one last once over and all of the involved formatting before it is released. The Sample Chapter available at the top of this website has been altered to match the edited text of the book. Alnanla has not always enjoyed her life as a Priestess and a teacher, but she, like every citizen of the Island of Nimoa, has always had her needs met. At night she gazes up at the energy shield that keeps everyone safe from the flying monstrosities of legend, and she wants more than just to exist in her pre-ordained role. When hundreds of innocents are massacred, Alnanla finds herself to be the prime suspect. To clear her name, she teams up with a grieving Bureaucrat, an eternally optimistic Artist, a gruff Outsider and a sarcastic Spirit. As they begin to discover the details of what really happened, they find more than they bargained for. Should they expose the dark secrets they find and risk their society’s destruction? Or should they sacrifice their lives and let the lies continue in order to preserve the way of life that has given them all peace and safety for thousands of years? There were aspects I liked about both covers, but due to the resolution issues I might contemplate using a different artist for the second Allmother’s Fire book than I used for the first one. I personally like this new one more, but I am curious what my readers think. Next Blog: THE RELEASE OF MANDATORY PARADISE! Woo hoo! One of the most frequent questions a writer receives is “Where do you get your inspiration?” The answer to that for most authors is varied. Personally a lot of my novels or the worlds they take place in have been inspired by history. Sometimes it’s an old or obscure culture, sometimes it’s a specific event. I normally go far from the original thing that inspired me, but it’s a good jumping off point for ideas. Once your characters are fleshed out they can constantly inspire you also. Even though they are just constructs good characters react to things in ways even the author may not expect, creating future plots and ideas. That’s good for the overarching plot but what about specific details? If your protagonists are in a fantasy world and travelling a lot, you may have to come up with a few dozen cultures/cities/tribes in a very short time. You could once again “steal” from other sources like history or repurposing other fictional characters (take Boss Hogg and put him in a Ninja culture and boom, instant interesting character) but after a while it might feel forced or repetitive. Many fantasy worlds are almost exactly like ours, with some serial numbers filed off and one or two minor changes to food or dress. You can normally figure out which ancient culture they are and after seeing most of “Europe” you expect to meet the “Scandinavian” culture of the world and like clockwork you do, three chapters later. When your normal inspirations take away your predictability you must do something to leap out of the rut you have created. Something perfect for new ideas is finding a way to be inspired randomly. My new go to resource for that is the random button on Wikipedia. You can get an insanely wide spread of ideas from people, from cultures, art, and ideas. In the current book I am writing, two of the characters need to go to a place to retrieve something. I knew the plot ramifications from this, I knew the thing to be retrieved, but I had not fully fleshed out where they were going, as it was not as important. All that was necessary was that the place was exotic, and differed greatly from where the characters originate. I clicked on the random button and got a country, an article about an energy activist, and information about a type of rock. My mind began to create order from this chaos, and I thought about what could possibly connect those three very diverse Wiki articles. I let the three ideas stew in my mind for about twenty minutes, and a great new location was born! You still have to create the ideas and write the scenes, but a tool like this is a great way to use random information to guide you. My personal writing style probably would not allow me to use this to create over arching actual plots. Most of my plotting is either generated from how the characters react to the situations they are in, or are thought of in advance to guide the story. However there are still parts of all novels that are not thought of until specific scenes are reached, and using this can help with those “mini plots.” Honestly any way to randomly generate information can help. You could flip through a large book like a dictionary, random searches on google or even flip on the TV and go to three channels if you wanted to synthesize something. The important thing is as a writer your mind is already good at finding connections between unrelated things, and this just a great way to jump start this process. Last I checked last week’s poll was tied, or within one vote of being so. This means I honestly do not know yet if I am going to take The Fall of House Nemeni off of its exclusivity with kindle or keep their one last time. This poll will be on Mandatory Paradise. It’s twice the size of Fall of House Nemeni, and self-contained. Due to the size I was thinking of pricing it at 4.99 (still less than commercial paperbacks and any fast food meals not bought off the dollar menu). Besides the size of it, if I don’t it will feel weird pricing my next book at 3.99 also. However, I don’t want to “price” this book off of peoples casual consideration list. Since it is the book coming out shortly, I will once again focus on this world. The main religious ceremony of Nimoa, the island this takes place on, is the sacred Bull Dance. Twelve Priests and Twelve Priestesses “dance” with the bulls. This is highly ritualized and include using “labrys” sacred axes that are found covering the labyrinth in the city’s walls. The goal is not to kill the bull, but to move with it. As said in a previous blog the clergy raise energy to work their miracles through dance, and this is a dance that most of the island participates in. The energy drawn that day sustains most of the citizens so they do not have to eat for the next month. Part of the reasons this island is Paradise is because no one ever goes hungry, as long as they show up at their monthly dance. Just because there is not physically the back of an e-book to look at does not make the description that occurs there with traditional books any less important. The Product Description of an e-book, the Synopsis, is the main peek into your novel that a possible reader has. Sure, in Amazon, they get a chance to preview a few chapters of your book; later on they may read reviews on Amazon or Goodreads. The text that gives them the motivation to look at reviews or sample chapters however is the book synopsis, making it incredibly important. I do not believe there is honestly any one specific way to do an excellent book synopsis. At its heart what you want to do is obvious; create a desire for your prospective reader to read your book. However different people respond to different things and each novel has its own unique challenges in how to give a compelling summary. Some people only want to read a book if the characters sound like something that hooks them. However what if you are doing a novel with enough twists that you do not want who your protagonists are to be obvious from looking at the back of the book? It might be due to rapid death of obvious protagonists, cases where the protagonists and antagonists switch, or even people who seem to be background characters at first are the true ones the spotlight will be on. When this happens vague descriptions help, or focusing on the character aspects you think will hook people, even if it misrepresents the novel (such as focusing on someone who seems a hero but will be a villain, if the description of the person is compelling inside a synopsis). Other times the plot itself has so many twists (think like the original Matrix) that an accurate description might ruin the impact of the narrative. In these cases one must focus on the characters in a synopsis, point out the compelling points of the obvious narrative, and then give small hints of the hidden twists (enough to intrigue) without giving it away. One of the best techniques, and it can combine several of the above focuses, is to have a description that makes the reader curious in general. Make statements or ask questions that makes them demand to know more. The larger the questions, or the more paradoxical the revelations seem, the more your reader will want the book just to assuage their curiosity. No matter how good your book is, if you can’t hook your reader with at least one of three tools (good synopsis, great cover, positive word of mouth) no one will try it in the first place. I will be covering some of the others in future blogs. As for now, all of these things are on my mind as we get closer to releasing “Mandatory Paradise.” Here are some possible synopsis. This may be familiar to long time readers of this blog, when I was getting close to releasing the Fall of House Nemeni. Like before, pick which description you like below. However, please feel free to correct or enhance the current ones, or offer entirely new synopsis’ in the comments or PM/email to me. You can also combine elements of multiple ones, but still please choose one of the below synopsis as where I should start my framework. A) On the Island of Nimoa everything is seemingly perfect. All of its citizens needs are met from shelter to sustenance to entertainment. Everyone has a role assigned to and safety is guaranteed. The monsters cavorting in the skies outside the city ensures no one desires to leave. A massacre annihilates these absolutes for a Priestess, A Bureaucrat, and an Artist and they find themselves fleeing everything they trusted while they search for the truth. Will they be able to reveal a conspiracy that has existed since the foundation of their island bound empire? If so, are they willing to give up their lives and maybe even their existence just to have the facts come to light? B) Alnanla has not always enjoyed her life as a Priestess and a Teacher, but at least she has always had her needs met like all the citizens of the Island of Nimoa. She has gazed at night up at the energy shield surrounding the sky of her island that keeps the flying monstrosities of legend out. Despite the fact this keeps her whole society free of strife, she has still wanted more. When a massacre occurs and she is the prime suspect she must team with a grieving Bureaucrat and an eternally optimistic Artist to find out what really happened. In doing so they reveal a conspiracy wrapped around every aspect of their society. Should they expose it and other dark secrets they find, risking their entire society’s destruction? Or should they quietly disappear into the night in order to preserve their way of life? C) The shield of energy that surrounds and protects Nimoa from the monsters outside of the island means that all the people’s needs are met and no harm can come to any of it’s citizens. This truth is proven false when a horrific massacre occurs, and a teacher Priestess is blamed for it. In her quest for truth and survival she finds allies in a wealthy Bureaucrat and an eclectic Artist as well as one who claims to come from beyond the shield. Can four people withstand a conspiracy and other dark secrets that have held their society together since it’s foundation? More importantly, is it worth their own lives and a few lies to risk destroying a way of life that has given them all peace and safety for thousands of years? Mandatory Paradise is now on it’s final editor! It has been through several, and this last edit is not really encountering any of the typos or normal issues that my drafts have had, due to the large amount of editors involved, and I am getting seriously excited. The next Allmother’s Fire book is getting to about the 40% mark for the first draft, and part of that has already gone through multiple editors, as I plan to keep that up the whole time so as to minimize time needed between when I finish my first draft and final edits. At its current pace I may even have the second Allmother’s Fire in time for the Holidays! This time it will again be about Mandatory Paradise, since that will be released earlier. On the Island of Nimoa each person has a role, and the magical things they can do have to do with those roles. There are also two types of ways to sue the mana energy that is on the island, through moving the whole body or just ones hands. Artists , Bureaucrats, and Craftsman work the mana energy with their hands to accomplish effects based on their roles (Artists make illusionary displays, Bureaucrats store and access information, Crafstman create, etc). Soldiers, Priestess and Priests, Laborers and others of that nature most move their whole body to harness the energy and complete their tasks. Be it dance, a memorized fighting style, or even the ritualized way one stomps grapes, the whole body must move for these amazing uses of the island’s energy to work. It is said it is impossible for anyone to use both forms of body movement and hand movement, as they are inherently separate ways to access the gifts the island has given them. One of the great techniques used to enhance a book is foreshadowing. It easy to do wrong, such as doing it so heavy handed and obvious that there is no surprise when the eventual pay off happens because you expect it. The other extreme is easy to accidentally do, to slip one line in the background and then not reference it again until a book or two later. When this second thing happens some readers might not even think it was not truly planned out, but that you just randomly took something that happened and gave it significance after the fact (hint: see Lost). I just saw “The Dark Knight Rises” and it my mind ended what I believe to be the best cinematic trilogy I have seen. The primary reason for this is a lot of inventive foreshadowing from the earlier movies, that if it was not planned, was done so perfect that it seems so. At the same time not all of it was expected either. In the blog I will not directly spoil events that happened in that movie, but I will refer to techniques used (seriously, spoiler free, any examples I give illustrating points will not be from the movie but might be from my own books). The best technique that I gleaned from the film was when hiding a plot thread that will have later significance but you do not want to make it too obvious at the time, is to have the conversation have a completely different set significance. That way you can do something like tell a story that gives examples of how ruthless a character is. The event’s told all point to this and focus on this. During that story of the past however a character may be introduced as an example of an object lesson in how ruthless the antagonist is, but the seeds might be planted for that same person to come back later and be a character you have already met, without knowing the connection between the two. The actuakl importnace of the character may also have nothing to do with the original display of ruthlessness. Another good use to make foreshadowing have more of an affect is misdirection. Purposely be heavy handed through something “obvious” like prophecy or even physical descriptions. Make it so that it “must” happen a certain way and “of course” this person will grow up to be Captain. At the same time you can plant many hints that another person could be Captain too, but “overwhelming evidence” points to the wrong person and only a second reading reveals how much the quiet young person in the corner was better suited all along, but looking at the obvious had obfuscated this. The final technique I think I saw but did not have proof of was to purposely keep a few threads open, but not attach a reason for them yet. If you do it too often it can go back to the earlier flaw of being so obscure no one believes it was purposeful. If only done a little bit though, such as knowing someone’s boyfriend left them under strange circumstances, or having a locket always around someone’s neck clues in the reader this is a mystery that might be important later. You do not necessarily have to even plan out what this may be, or you may have two or three ideas and he let the actual flow of the narrative dictate what is the most common sense conclusion and then use it. No matter what letting a few loose threads fray at the end may help you weave a more beautiful tapestry later. The second book in the Allmother’s Fire trilogy will now be called “Rise From the Sun Below.” This book is past the one third mark, maybe around 37% complete or so for the firstfDraft. 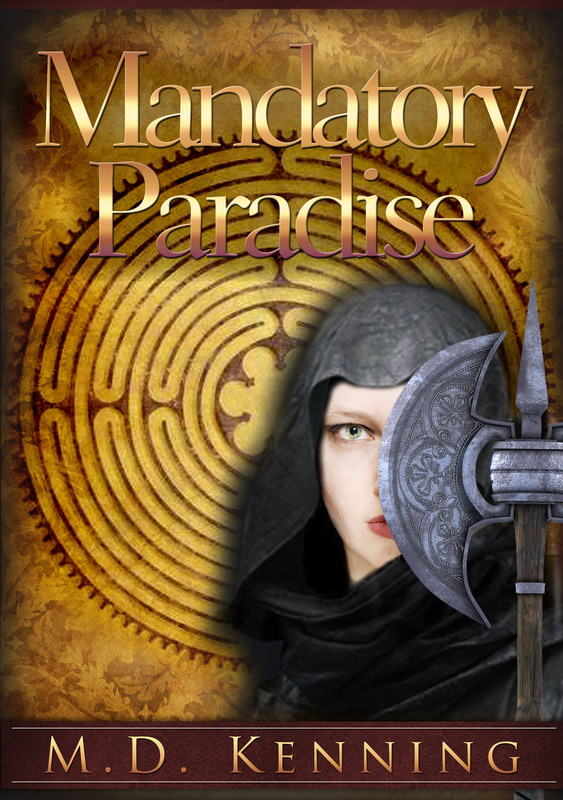 The epic thriller fantasy novel will be called “Mandatory Paradise”. Although sporadically edited by multiple editors in the past it is now a good 85% done through a longer very thorough editing. The last sentence was not intended to offend any Leprechauns or their family (you know who you are). Currently I am looking to see who I would want to do the cover Art, and plan to choose before the end of the month. Just like I asked advice for titles, I will now get some vague advice towards the cover, to have something to give the cover artist. This is for the Mandatory Paradise novel. 1)Mainly symbolic. Although it can tie into things from the book, the cover should reinforce the name of the book. 4)A combination of these things. If you choose this, please clarify what you mean in the comments below! Since my next focus (not in terms of what I am writing, but in terms of marketing and getting published) is Mandatory Paradise, I will start giving tidbits about it. This will also help when it comes to ideas for the story description. The book takes place on an Island named “Nimoa.” On this island it’s inhabitants live pretty perfect lives. Their nation houses them, gives them all the sustenance and wine they want, entertains them, and gives them roles to carry out in their lives. They are safe, never knowing war, and rarely do the Legions even have to act against common criminals, for they are few. Why have crime when you get everything you want anyway? Part of why they know they are safe is because the whole island is surrounded by a mystical shield. On the other side of the shield they can see all the monsters and myths of legends careening in the sky, and destroying the outside world. As long as they listen to what they are told they are safe, happy and protected, right? So what happens when a massacre occurs that makes their entire existence seem suspect? That is the setting for Mandatory Paradise. Today I will be posting and interview with Rober Eaton, the author of “The Hero Always Wins.” He is another member of the Genre Underground, and his first novel is both dark fantasy and comedic at the same time, and a very enthralling read. MD: The world seems to be an interesting mix of seemingly familiar concepts (heroes, fire wielding bad guys, orders of knights with magic swords, etc) with original spins on them (exactly how the heroes work and the warlocks, etc). Are there any specific inspirations for this world and how it works, or was all of it an original world from the ground up designed to feel like a familiar type of tale? Robert: As you’ve pointed out, the world of The Hero Always Wins is inspired by a number of traditional fantasy elements. I love Lord of the Rings, Game of Thrones, and the like, and wanted my book to have some of that feel. However, I think my world has a lot of original elements as well. One aspect that is unique to the world of The Hero Always Wins is that the scale is much smaller than many other fantasy worlds. I didn’t want armies of millions where a single hero could hardly have an impact without god-like powers. Instead, I created world that could be travelled by horse in a matter of a few weeks, and large cities have populations in the thousands. A few hundred warriors constitute a sizeable army, and individuals can really turn the tide in battle. MD: Tell us more about how the heroes (and the Leorht) work, and what makes them different from typical tales. Any world information you want to give, either that can be gleaned from the books, or that you had thought of but not necessarily spelled out in the book. Robert: I love tales of magic, but one thing that always bothers me in fantasy is when a hero has too much power. So often I see fantasy series go off the rails because the hero is nearly invincible and only complicated loopholes can challenge him. To this end, I wanted to create a magic system that gave my heroes power, but kept them vulnerable as well. Generally, my heroes have a very well defined set of abilities. Those that follow Leorht, for example, have the ability to wield properties of light. The move with a heightened sense of speed, and can summon limited amounts of electricity to aid them in battle. Beyond that, they are as human as any other warrior on the battlefield. MD: Without going into spoilers, I will say I enjoy how as the book goes on, the reader cannot necessarily know where things are going with characters, even though at the beginning it seems to be very typical of its genre. This makes me wonder, did you know an overall outline before you wrote, including the twists, or did the twists come to you as you wrote. What is your process in general when writing in terms of you the author knowing the plot? Robert: Most if not all of my plot twists are planned well in advance. I always develop an outline before I start the actual writing. At the core of my outline are a series of plot events which form the critical path from beginning to end. I also throw in specific lines of dialogue, bits of imagery, side plots, and other “cool” ideas I have that I want to work in. From there, I start writing, and ad lib the details of each chapter as I go. Sometimes the journey leads to changes in the original outline, but generally the major plot elements go unchanged. MD: Your structure is a more typical chapter based structure, but I have noticed many modern idioms and phrases in the chapter titles. Was this a conscious decision to add some “tongue in cheek” elements to the story or a more unconsciously motivated decision? Robert: Modern idioms and tongue in cheek phrases are central to my writing. When I first started writing, I tried to mimic typical fantasy influences from mythology. However it didn’t take me long to realize that I don’t care about mythology. Instead, I drew on those cultural elements that are near and dear to my heart: pop culture. So my books, though set in a “traditional” fantasy setting, are chock full of references to sports, music, and modern slang. As for some of the “tongue in cheek” elements, I love a good pun. Some people may find it corny, but there is a playful cleverness to puns that amuses me. I also like to mix in elements of satire, which I think goes hand-in-hand with the cheekiness. Basically, I live in 21st century America. Just because my head is in the fantasy world doesn’t mean my feet don’t touch the ground around me! MD: Tell us more what got you into writing this book. Are there any specific trials or stories in your own life that occurred from writing this? Robert: Honestly, this book is influenced by video games as much as anything else. I grew up on Dragon Warrior, Final Fantasy, and the Legend of Zelda. I love heroes like Kratos from God of War, and villains like Arthas from Warcraft. I started writing partially because video game stories got in my head and I couldn’t get them out. Does that mean my books would make a good game? I don’t know, but I’d like to think so. MD: What is your background/training as a writer, or any prior experiences in writing? Robert: I don’t really have any formal training in writing. I do have two Ivy League degrees, and took a few writing classes along the way, but never majored in English, Creative Writing, or anything like that. I owe most of my writing ability to genetics and my high school English teachers. I always did very well in writing throughout school, and I had a few teachers along the way who really helped me understand how to channel my ability into a decent story. MD: What would you say you focus on as a writer; themes, plot, or characterization? If it’s a combination of these, let us know which you feel you focus on the most, and why? Robert: Definitely characterization. I love my characters, and have a vision for them from cradle to grave. I don’t generally have characters who managed to live boring lives as simple farmers or blacksmiths until the age of eighteen. Instead, my characters have colorful backgrounds chock full of adventures that happened before my book begins. My writing, however, concentrates on what I consider to be the main adventure of a character’s life, the adventure that leads them to ultimate glory or ultimate demise. My characters have real emotions and real motivations. They are driven by the same things that drive us all: love, greed, fear, and duty. In the end, every one of them is doing what they think is right, either for their nation, their loved ones, or themselves. MD: What makes you the rock and roll star of fantasy writing? Robert: Rock and roll has always been central to my life. I grew up in the late eighties and early nineties, watching glam rock and metal morph into grunge and rock-rap. I always identified with the wild, lustful, and dark undertones in rock music, and I carry those undertones into my writing. In my mind, every one of my characters looks like someone you could find at a music festival. Some are on stage, some are carrying equipment, some head-banging in the audience, and some are selling weed behind the porta-potties. They’re all there though. MD: Finally is there anything you would like to tell us about your upcoming book? Robert: The last question is actually a good segue. My upcoming book, the sequel to The Hero Always Wins, takes the rock and roll from backstage to center stage. Music is part of the plot, and one of the settings is a fantasy version of the Sunset Strip circa the mid-80s. All your favorite characters are back, with the action picking up right where the first book left off. The mood is darker, the battles bloodier, and the plot twists crazier. It’s taken a little longer than I’d hoped, but the book is finally coming out this fall, and I couldn’t be more excited. If you loved The Hero Always Wins, stay tuned; the sequel is going to rock your world! As for my regular readers it looks like “Mandatory Paradise” is winning completely in the poll for the name for the new standalone Fantasy Thriller Epic Novel! With the name decided we will be moving soon onto the next stages of getting that novel out. So after I published the The Fall of House Nemeni as I was awaiting feedback one of the readers kept sending me notes. They included what he liked, but also included the points that were confusing, or he felt defused tension to early, etc. Ie they were an honest critique not of the copy/line editing variety but of a how the readers see and comprehend the story. When I knew I would make a revision of the story to help pare down the typos/grammar issues I realized I had an opportunity to make the story tighter too. He was the first one that made me realize Chapter 3 had to go, and other various small issues were cleared up or made more hidden depending upon the topic. If you bought the book after June 30th, this is the version of the book you have, and I am still working with amazon to make the newer revision available for readers who bought the earlier edition of the book. You can definitely thank Dan G. for the tighter version of the book (this is not the Dan thanked in the book), without whom those changes would not have happened. At the same time, you do not have to follow everything they say either. They are not writing the book, they are not the “editor” who decides if it gets published. There will be times that your style, and how you choose to frame the narrative will be different than their preferences. In that case as a self-published writer you need to go with your vision of what the book needs to be over any one specific reader. At the same time it’s great to have that one constant voice questioning what you are doing so you can make it stronger. Speaking of book names, time for today’s Poll! This is meant to be the final naming Poll for the new epic novel, formerly known as Nimoa. I have pared it down to two choices, one the top poll pick from the large list, and the other a really great sounding suggestion given. Upcoming on the blog this month you should be seeing an interview with one of the other Genre Underground writers, some world information about the new Epic, and the typical posts about writing and e-publishing. For today’s world info we will stick with the Allmother’s Fire series. An interesting tid bit is although their main religion has a God like analogue with the Allmother, there is definitely no specific Satan like analogue, even though much of this church is similar to the Catholic church. There are said to be a race of creature’s called the “Firesouls” however that come up from the Sun Below. They are said to be able to either burn people or even take over their body and souls if they are not blessed by the Allmother. The best way to be free of the influence of the Firesouls so to go to the Questionary weekly. This means not only sing the songs and the formal worship, but then later be with a Priestess inside a Questionary and admit your sins before the Allmother. You are then anointed with the sacred oil and drinking her holy drink made of specific herbs that only the Priestess’ know of, and then the Firesouls will not be able to reach into your heart and soul, at least for a little while. It is grumbled by some that this means the Church has an inordinate amount of power, since it knows everyone secrets. The Church always responds it will never use that power lightly, and only cares about saving the souls of everyone on all the Islands. It’s a truth often forgot by readers: Characters and Authors can and do lie. That Ancient prophecy might not only be false, even worse it could be a trap sent to manipulate future populations to do certain actions. Just because the head villain says he’s your father doesn’t mean he’s not just saying that so he can cut off your other hand. The Old wise Man leading the hero down the path to his true destiny might actually be stealing everything the hero owns why he is away from his house. Readers have this tendency to see the Author themselves and certain devices (wise old women and hermits, prophecies and last will and testaments, deathbed revelations, etc) as immutable truth. Part of this is from the oldest myths encouraging this, sometimes it’s latter day laziness on modern authors, or maybe it’s just the feel that an author is revealing a world and story to you, so you can’t imagine why they would not tell the truth. This of course means that some of the greatest emotional shocks can be from when one of these trusted sources lies to you. If done too much the readers won’t trust anything and they can be numbed by further twists. It can be as bad as M. Night Shamalyan (don’t make me spell this right) movies got, or poorly written soap operas. If used sparingly though you can hook them into the narrative and then turn the tables on them when unexpected. It is definitely something I utilize in my writing (including the section I am currently working on in my novel). The current novel I am reading also utilizes it. As a person who loves twists I had guessed the big one but the way it was revealed showed further twists ripple out of the main one I was not expecting, and caused the same sort of reaction I like to give to my readers! Personally I think the best way to serve a lie to the readers is with the sandwich method. Have two things they expect to be true or from true sources turn out that way, and then then in the middle of that have a lie. It makes it much harder to expect, and means thata later truth they will think is a lie won’t be. In other words, this allows you to shock them with the truth! The poll is being narrowed down from the last post, and I may keep it open for a few more days. I will then narrow down the Epic Novel book title with one more poll where each voter cna only vote once. Either way I should know the title by the end of next week, and then I will be searching for a new cover artist. This next epic novel (not the new novel in the trilogy being written) has a different feel, so I wanted to brand it with a different artist. Today’s poll is about naming, though. The second novel in the Allmother’s Fire trilogy is what I am currently writing, and I have narrowed it down to two names. If you have read a decent amount of the book the reasons for these possibilities will be obvious, with the more you have read giving more nuance to both possibilities. I have run both of these names through my mind for a while, and I at least wanted to see what others are thinking. One of the types of Noble Houses not currently shown are the one’s whose Domain is over Motion. There are multiple Houses that have these abilities, but each manifest in different ways. Some are direct, and can move themselves or vehicles or weapons faster or slower depending on their specialty. Some are more indirect, and can use control over motion to increase or decrease the temperature. These users do not know why it works this way, but the results are obviously true. The other Houses not detailed yet are a lot of the minor guilds. Some of these like the Dyemaker’s guild have as much temporal power as the lower noble houses, but the span of their abilities are so narrow (being able to change the color of objects in the case of the mentioned guild) they do not command as much respect. It seems like there are an infinite amount of families that can do some minor thing to loophole the Grand Laws of the Universe. It is thought by some that even the lowest peasant might find that his family had some unknown ability if only they had the leisure to practice and figure out just what they were.